Abarth triumphed in the Mini Car category, coming first in the imported car category and third in the general ranking. The prestigious recognition was awarded by the readers of the "Auto Motor und Sport" group magazines. The new year could not have started better off for Abarth. With Abarth 595 and 695, the brand of the Scorpion triumphed in the fortieth edition of the "Best Cars" competition, one of the most important international consumer surveys in the automotive sector. The readers of the automotive magazines of German publisher "Auto Motor und Sport" in 15 countries were asked to evaluate 364 vehicles in 11 categories. Two rankings resulted: one general and one for imported brands. Abarth 595 prevailed in the imported car ranking of the Mini Car category ahead of the other 15 candidates. The car also came third in the general Mini Car ranking being the only sports car to gain the podium of the 20 models in the running. Abarth is always ready to surprise just like back in the 50's and 60's when the small, agile car created by founder Carlo Abarth commanded the respect of beefier sedans and was known to even overtake competitors packing larger engine displacements on the racetrack. Still today, Abarth 595 is confirmed as an extraordinary car that allows ordinary motorists to enjoy thrilling driving experiences. Sedan or convertible, the Abarth 595 range features three trim levels ("Elaborabile", "Turismo" and "Competizione"), three power levels of the 1.4 T-jet engine (140 HP, 160 HP and 180 HP) and two transmissions (five-speed manual or robotised sequential). Abarth 695 Biposto, the "smallest supercar" completes the line-up. Delivering 190 HP, the car secures the thrills and technology of a real racing car on everyday roads. The iconic Caimano concept car will be featured in a special exhibition dedicated this year to the revolutionary designs of the 1970s. The "wedge on wheels" thought up by Italdesign is based on the chassis of the Alfasud, another of Giugiaro's creations, and is a fine example of the extreme design of its time. The only example of the model belongs to the Alfa Romeo Museum. The Motor Show will take place from February 5 to 7 in Bremen and will open the classic car season. It will bring together some 650 exhibitors in eight halls covering an area of over 45,000 square metres. The special exhibition entitled "Die 70er: Einfach Keil", dedicated to the revolutionary designs of the 1970s, will be the climax of the Bremen Classic Motor Show which will be taking place from February 5 to 7 and will open the classic car season. It will be the perfect opportunity to admire a parade of wedge cars which are typical expressions of the extreme design concept of their day. Together with the Lancia Stratos, the Maserati Khamsin and the Lamborghini Countach, one of the stars of the show will be the Alfa Romeo Caimano made in 1971 by Italdesign on appointment by Alfa Romeo. This one-of-a-kind concept car today belongs to the Alfa Romeo Museum in Arese (Milan), which is also known as the "Time Machine". The car was built on the chassis of the Alfasud and presented to a stunned crowd at the Turin Motor Show in 1971. Established by Giorgetto Giugiaro and Aldo Mantovani, Italdesign had recently designed the Alfasud, which interpreted the hatchback concept in novel manner: the car featured a low front end and a compact front boxer engine (unique in its segment). It had superior room inside, a generous boot and - as naturally expected from an Alfa Romeo - its handling and roadholding were best-in-class. The Alfasud Sprint - the coupé version of the range - was presented precisely 40 years ago in 1976. In that case, Italdesign designed a light, streamline car that enhanced the dynamic qualities of the Alfasud even more. The appointment to design the Caimano came with the brief to create a car which had no chance of actual production. Perfectly in tune with the unshakeable trust in progress of the day, Giugiaro designed a "wedge on wheels" which relegated to a secondary role everything that came before it. Italdesign created a body that appeared taken directly from a science-fiction book on the Alfasud chassis shortened by 20 centimetres. The two-seater passenger compartment was closed by a forward-opening glass dome that made the car look like a space capsule. The A pillar was entirely eliminated, while the B and C pillars joined to form a roll-bar behind the passenger compartment. The rear part of the roof formed a spoiler which could be adjusted to four different positions to a 32 degree angle from the inside. Under the dome, driver and passenger reclined in stretched basin seats with built-in head restraints. Instead of opening windows, the car had two small openings on the side edge of the dome to allow contact with the outside world and ventilation inside. The cylindrical dashboard had two large instruments with unusual displays on which it was the dials not the hands to turn. A bulge on the bonnet made room for the 68 HP, 1.2 litre Alfasud engine, which being a low-height four-cylinder boxer was particularly suited to equip the wedge car. Finally, seventies signature pop-up headlights embellish the front. Consolidated Ideal TeamVenture, please save LANCIA auto brand !!! Congratulations to the two car brands in your portfolio! Unable to make a small sacrifice and buy brand LANCIA? To save from Sergio Marchionne's criminal hands? Or even get in touch with your friends from Asia? PLEASE PLEASE-PLEASE! Good luck in auto activity. It is not just a simple website, but rather an experience whereby visitors delve into the world of Abarth through the brand new portal, that only recently went on-line, to share the passion and technology of this great brand. By typing in the address, www.abarthcars.co.uk, as soon as they access the home page, users immediately get the impression that they have entered a virtual showroom, where the cars are all in the front line and the information is just a few clicks away, whatever the device they are using. Indeed, the website is fully responsive: this means it stands out for its design which ensures greater visualisation and more efficient operation on all devices enabled for web browsing, such as PCs, tablets, smartphones, iPads and iPhones. The virtual experience explores every facet of the world of Abarth, starting from the range, which is presented with large, eye-catching photos in a dynamic carousel. 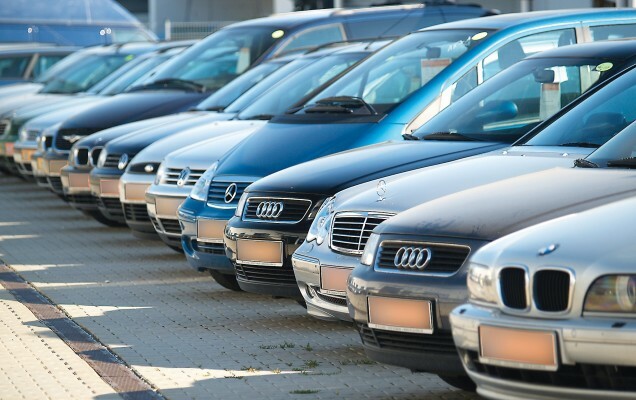 As soon as a particular product has been selected, the technical information and special offers relating to that car appear clearly and simply. Users can switch from the virtual tour to a real-life one just as smoothly thanks to the calls to action urging them to book a test drive or request a quote, to find their nearest dealer to install the tuning kits or the accessories sold in aftermarket or to receive a brochure. The Abarth brand lives and allows users to live and experience the various souls of the brand - from customisation to sports, from its history to the communities - and takes them directly into the Officine thanks to a virtual tour of the venue which best represents the brand's DNA. All this is distinguished by a high-impact layout, which plays with the reference colours: red and white with splashes of grey, which enhance the high-performance high-tech soul of the brand. The section dedicated to Kits and Accessories shows in large photos how details can make the difference, so users can customise their car 100%, increasing its performance even further, while Abarth Racing, which is dedicated to a younger clientele, takes visitors right into the heart of the racing world, with special focus on safety, presenting the courses available at the Abarth Driving Academy. The legendary Karl Abarth comes back to life in the section dedicated to the brand history, accompanying users along a journey discovering the legend of the Scorpion through photos, anecdotes and truly beguiling testimonies. The same beguiling charm can also be found in Officine Classiche, which were inaugurated in Turin last November. They are dedicated to those who want to restore their vintage Abarth and represent a new place filled with experience, professionalism and painstaking care for details. Like all historic brands, Abarth also relies on a vast international community of enthusiasts. The Social Wall is dedicated specifically to them. It is a sort of forum which collects everything that is published on the brand's official Facebook, Instagram, Pinterest and Twitter channels and on the main web newspapers. In order to stay in touch with the brand at all times, users can subscribe to the dedicated newsletter, containing news and investigations so as not to miss out on anything new from the Abarth world. Versions dedicated to other markets will shortly be on-line as well, so that Abarth enthusiasts from across the globe can stay constantly up-to-date and follow all the goings-on in the world of the Scorpion brand. De ce Lancia? se intreaba colegii de pe http://www.clublancia.ro/forum . In 2015 the Jeep® brand set its all-time sales record in the EMEA region (Europe, Middle East, Africa) with 117,620 units sold and volumes up by 55.7% in comparison with 2014. After 26 months of uninterrupted year-over-year growth achieved through December, Jeep ended 2015 reporting its third consecutive year of commercial success and confirming the brand's momentum and customer appreciation in the region. Since 2009 Jeep sales have tripled in EMEA, with the region currently ranking second in terms of volumes after North America, with a share of 10% of the brand's global sales (compared with 7% in 2014). In Europe (EU28 + EFTA), Jeep was the fastest-growing automotive brand recording a 132.2% increase* in a year that also saw the best performance ever in terms of volumes for the European market with 88,200 registrations and a 113% increase compared with 2014. Several EMEA countries recorded their best sales year ever in 2015. In Italy, the top selling country in the region, Jeep set its all-time record with sales almost tripled in comparison with 2014 and with Jeep being the fastest-growing automotive brand in the country. Recording a total of 14,995 new registrations, Jeep achieved its best annual result also in Germany with sales up by almost 42.6% versus 2014. The UK sold more Jeep vehicles in one year than in the four years of 2011 to 2014 combined, recording a growth of 176.1%, compared with 2014 sales. 2015 was the UK's best year ever, with Jeep being the fastest-growing car brand in the market last year. In France Jeep also recorded its best ever full-year sales performance with an increase of 208.5% (8,585 units) versus 2014, mainly driven by Renegade. Also in Spain, Jeep closed 2015 as the fastest growing brand in the automotive sector (205.4%) and set its all-time annual sales record. During the twelve months of 2015, more Jeep vehicles were sold in the Spanish market than in the previous three years (2012-2014) combined. "4x4 of the Year 2016" - 4x4 Magazine (UK) December 2015. With 28.159 units sold, the flagship Grand Cherokee made an important contribution to the brand commercial success, accounting for almost 24% (23.9% precisely) of total 2015 sales and being the 2nd best-selling Jeep model in the region. Jeep Cherokee significantly increased its performance versus 2014, while the iconic Wrangler confirmed its steady performance with 14,109 units sold. Jeep® Winterproof, the winter event organized by Jeep in some of the most renowned skiing resorts in Europe is starting today in Gstaad, in the Swiss Alps, till January 16th. For the public, it is a unique opportunity to get to know and test drive the most awarded SUV range ever in one of its natural settings. Four exclusive mountain locations in Switzerland, France, Austria and Italy will be the stars of the 2016 Jeep winter tour and the perfect background for all enthusiasts to enjoy exciting test drives onboard the brand's 4x4 vehicles both on and off-road. Designed for nature lovers and 4x4 enthusiasts, the 2016 Jeep Winterproof Tour is a celebration of the spirit of adventure, involving passionate people that share the same passion for mountains, active sports and outdoor activities. The same values are also expressed by the legendary Jeep brand's models, which are capable of transforming ordinary driving experiences into extraordinary journeys under all possible conditions. Jeep has a strong relationship with the world of mountains and premium ski resorts in the European Alps. Not by chance, the mountains are the perfect place to test the 4x4 capability, reliability and safety guaranteed by Jeep models in facing the toughest trails and taking on the most extreme challenges with confidence. In any season, the Jeep range offers the greatest comfort and the chance to go everywhere in maximum safety, even on ice and snow. Always associated with an adventurous and unconventional lifestyle, Jeep will offer a series of special activities to enhance the tour to its best, allowing customers to experience an SUV equipped for winter's toughest terrain. The Jeep Lounge - a dedicated meeting place for everyone who shares Jeep values - will be set up in all the locations of the tour and will be the starting point for test driving the entire lineup. A fleet of about 20 Jeep SUVs will be available for guest shuttle services between the different locations of each tour leg and for adrenalin-charged test drives onboard the flagship Grand Cherokee, the most awarded SUV ever, the iconic Wrangler, Cherokee which blends the legendary Jeep 4x4 capabilities with cutting-edge design and Renegade, the compact SUV with the best off-road capabilities in its category. Visitors that will participate to the 'Jeep Driving Experience' will test the capability of the Jeep range on three off-road trails - the blue, the red and the black track - each featuring different degrees of difficulty and duration. At the end of the test drive, visitors will be invited to the 'Jeep Ice Experience': a safe driving lesson on a specific ice track held by professional drivers who will demonstrate how to tackle extremely difficult and slippery surfaces. In addition, all those who will complete the test drive, as also any guest visiting the Jeep Lounge, will be offered the chance to participate to the 'Jeep Skiing Experience': a 'wakeboarding', that will allow them to ski on a special, dedicated snow route while being towed by a Renegade. At each leg of the tour, children will also enjoy the exciting opportunity to test drive a Jeep: a pedal-operated Jeep kart featuring the styling cues of the brand will be made available to the younger public on a dedicated racing track. Parents will be invited to take their children to this area and let them exercise and improve their driving skills as future Jeepers. Lastly, Jeep will be present on the slopes at the various legs of the tour with an array of activities targeted at presenting the brand and its entire lineup. In France and Italy, fashionable chalets customized by the brand will be exclusive meeting points for those who share the Jeep values and will offer visitors the possibility to enjoy pleasant moments of relax during the breaks from the ski slopes. Articol in curs de editare ! Starting today, the new Renegade Night Eagle debuts in Jeep brand's showrooms of selected European markets. This new limited edition model - 2,500 units available for sale in the EMEA region - enhances the unique design of the first Jeep® that is built outside the United States and sold in over 100 countries worldwide, including the United States. Based on the Longitude trim level, the Night Eagle special edition features unmistakable satin-finished dark gray design elements that reassert the model's bold, original personality and its natural flair for customization. The audacious look of the Renegade Night Eagle accentuates the distinctive style of Jeep small SUV that features the best off-road capabilities in its category. Merit for this goes to the satin-finished accents that adorn the Jeep badges, the front grille, the fog light frames, the roof bars and the dedicated badge and are combined with exclusive 17-inch black alloy rims with M+S tires. The special-edition model introduces new matte paintwork called Volcano Sand which complements the other four body colors available: Carbon Black, Alpine White, Glacier Silver and Solar Yellow. In addition to its specific exterior, the new Renegade Night Eagle is equally exciting inside as it comes with a range of standard equipment that creates a comfortable, high-tech driving environment. Some of the most interesting features include leather steering wheel, new special Bark Brown fabric seats with electric lumbar adjustment for the driver, UConnect with 5-inch display, manual climate control system, 3.5-inch display TFT instrument panel, Cruise Control and rear parking sensors. Renegade Night Eagle can be specified with 2.0 Multijet II (120 HP or 140 HP) with Active Drive full time 4x4 system, 1.6 Multijet 120 HP 4x2 or 1.4 MultiAir 140 HP 4x2 engine depending on the market, combined with manual transmission. The sixth generation of Fiat Ducato won the accolade awarded by the readers of the specialised magazine "Promobil", further confirming the success of the leading model in the sector and key reference for all European camper van manufacturers. Fiat Ducato wins yet another international award: for the ninth time running, it was named "Best Motorhome Base Vehicle 2016" by the readers of "Promobil", the specialised German magazine that has been considered the barometer of the trends in the motorhome sector for more than 25 years. The undisputed number one model on the motorhome market in Germany has received the top score, leaving behind Mercedes Sprinter and VW T6. Once again, Fiat Ducato, base vehicle of choice for a multitude of camper van variants made by different manufacturers, has prevailed over the competition put up by similar vehicles. Bernd Wachtel, Head of Bodywork for FCA Germany AG, will be collecting the prize at the ceremony which will be held during the CMT in Stuttgart from January 16 to 24. CMT is Europe's most important trade fair dedicated to caravanning, motoring and tourism open to the general public. Last year it attracted over 240,000 visitors. The award complements the trust expressed by manufacturers and customers and is further confirmation of the efficacy of the modern, innovative approach adopted by the light commercial vehicle department of Fiat Chrysler Automobiles for Fiat Ducato, which is simply the perfect base for becoming a camper van. For many years, the features of Ducato, for the building versions van, chassis cab and chassis cowl, have proven to be winning for motorhome owners: in its square, box-shaped cargo compartment, every centimetre can be cleverly exploited to make all the space available for holidays. What is more, Fiat Ducato has a rich range of Multijet engines and gear-boxes - including the robotised Comfort-Matic gear-box available for the engines with 130 hp, 150 hp and 180 hp - and an excellent steering circle to facilitate manoeuvring. More strong features of the vehicle are the comfortable and car-like ergonomics and driving and its peerless comfort, guaranteed also by its excellent visibility, its comfortable "Captain Chair" style seats with integrated head restraints, its adjustable steering wheel and hydraulic power steering. Last but not least, Fiat Ducato is packed with active and passive safety devices to travel with confidence. The Ducato base is leader in the motorhome sector and the chassis of choice for all European motorhome manufacturers: during the past ten years, over 500,000 families have safely and confidently chosen to travel and enjoy their holidays in a Fiat Ducato base camper van. With many years of experience under its belt, Fiat Professional offers a unique range of services dedicated to Fiat Ducato base motorhome users for organising their trips, exchanging experiences and intervening promptly wherever needed. În luna august Executivul adopa un proiect de act normativ care prevedea că persoanele care au achitat taxa specială pentru autovehicule, taxa de poluare sau taxa pentru emisii poluante pot solicita restituirea integrală a sumei achitate fără a mai merge în instanță. Dar acest act nu poate funcționa fără o procedură. La finalul lunii decembrie, Fiscul și Ministerul Mediului au lansat în dezbatere publică procedura de restituire, iar astăzi acesta a fost publicată. Pentru restituirea vechii taxe auto, contribuabilii vor trebui să depună la organele fiscale competente o cerere și o serie de documente. 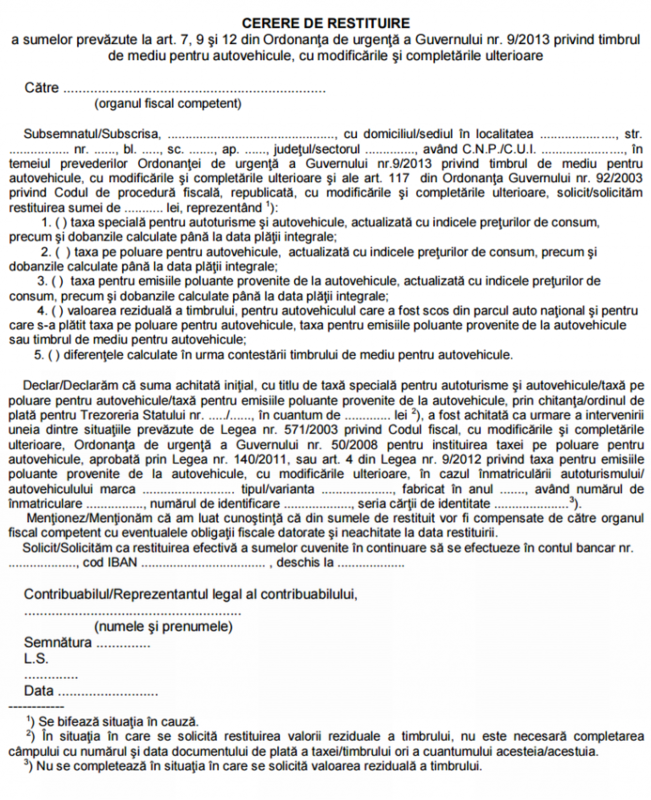 Toate aceste documente, împreună cu cererea de restituire se depun la registratura organului fiscal competent sau sunt trimise prin poștă, neapărat cu confirmare de primire. Atenție! Cererea va putea fi depusă până la 31 decembrie 2020. De asemenea, contribuabilul trebuie să menționeze și contul bancar în care se vor face plățile. Draga Sergio Marchionne, nu ma cunosti, eu unul nici nu vreau sa te cunosc... dar te rog asa, anul acesta bunul Dumnezeu sa-ti lumineze mintea si sa vinzi brandul LANCIA...... poate cineva mult mai destept decat tine, va face treaba buna. Asa sa ne ajute Dumnezeu ! Mergi in pace ! AMIN ! Dear Sergio Marchionne , do not know me , I for one do not want to know you ... but please do so this year God to illuminate your mind and sell brand LANCIA ...... can someone much smarter than It will do a good job . So help us God ! Go in peace ! AMEN !